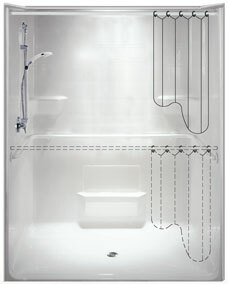 The bathing fixture designed for the custodial care environment must focus significantly on ensuring trust in the caregiver and providing security for the bather. The Comfort Designs skilled nursing package does just that. The lowered positions ensures dignity but allows for caregiver assistance. Some curtains have zip down windows that provide the same option. Caregivers prefer end wall valve placement with extra long 72” hoses with hand held showers with pause control.